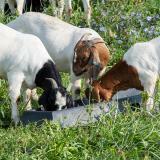 Use this portable 5 ft trough to water or feed sheep, goats, livestock protection dogs, ducks, geese and poultry. Withstands all weather and animal conditions. 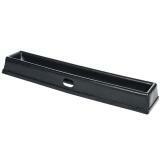 Need a smaller trough? See PortaTrough™ 3. For grain, salt, mineral or water. Can be set right on the ground in all weather conditions. 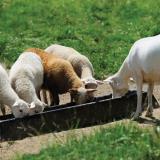 Feed or water sheep, goats, livestock protection dogs, ducks, geese and poultry. Water depth allows waterfowl to bathe their heads and necks. 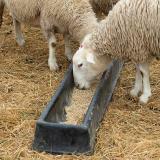 Rounded inner base prevents sheep and goats from standing in the feeder. 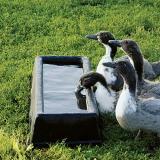 Feeder, waterer, duck bath, you name it, a PortaTrough can do it. They are a lot easier to pick up and move than a wooden feeder plus they’re easy to clean. 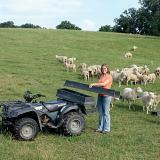 We use a number of these to provide extra grain to our ewes who are raising triplets as they need the extra “groceries”. We have never seen one tipped over when we’ve gone to do chores. Tough enough to withstand the elements and everything… Read More » up to being run over with a tractor (we’ve done this, it’s a great way to ruin a PortaTrough). Working well for ewes that needed extra bunk space. 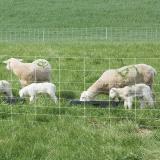 Can't be flipped by the animals; require minimal cleanout and that only because lambs are also present and not deterred from stepping in them. I like that they are easy to carry/move and still stay in place when in use. My intention was not to use it as a feeder but as an electrolysis tank. As a feeder it would have been great. The measurements were misleading causing it to be too small for its intended use. Here are the true inside measurements at very top 54 3/4"L x 6 7/8"W x 5 3/4"D. It starts curving rapidly from the top. The very bottom is 49 5/8" long. I would recommend it for its intended use as a nice heavy duty feeder, but if you want to use it for a de-rusting tank is it not well suited for that due to the curved bottom. Porta Trough 5 - Perfect Size for watering our Ducks, Chickens and Guinea fowl in Winter with use of a small electric deicer to keep water from freezing! It will be great for the summer too. Easy to empty, clean and refill. Easy for a woman to empty and move around. A must have for any Farm or Mini Hobby Farm! Great feeder and very well made. We were using several buckets or round feeders before. The dominate goats would then chase everyone off the buckets. With this long feeder the dominate goats will leave everyone alone a little better. Hasn't totally gotten rid of the problem but seems to help. 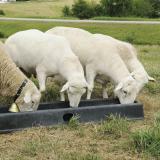 The best feed trough for sheep and goats, they can't jump into them or lie in them, easy to carry, move anywhere you want, easy to clean, and the animals can't flip them over. Strong, thick plastic. Best investment I've made, has made feeding time much easier.